Finally! Fall weather! The most recent bout of New York rain has dropped temperatures considerably, and with the onset of autumn, I tend to dust off most of my shoegaze collection and listen to it obsessively. Don’t worry folks, I won’t be clogging up these pages with dreampop (unless you ask, of course), but to kick off the first proper week of autumn, I’ll toss one out. Today’s band is An April March (not to be confused with ye-ye revivalist April March), a four piece unit hailing from Toronto, Canada. Formed in 1989, the band lasted a decade before splitting up, leaving behind a trail of 7” singles and 4 full length records. The band combined the dark-bass driven fury of post-punk with a budding shoegaze sound- swirls of guitar feedback and heavily chorused female vocals. The band split in 1999 after a handful of parting gigs, and vocalist/guitarist Danella Hocevar and guitarist Christopher Perry soon formed the band rethotred. 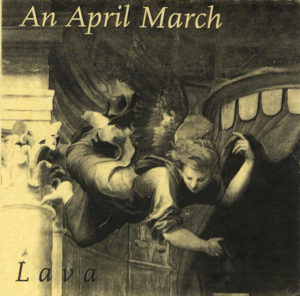 Today’s tracks compromise their 1994 7” single for ‘Lava.’ The A-side also appears on their 1995 EP Instruments of Lust and Fury while the B-side was already released on their 1993 record Impatiens. There’s a video for “Lava” as well! A few of their cds, cassettes, and vinyl can still be found through various online outfits, they manage to fetch a hefty sum from those who are aware of their scarcity! Fortunately, yours truly managed to score the 7” single posted above for a mere buck back in my college days, so have hope if you’re a collector! This entry was posted on October 12, 2007 at 5:41 pm and is filed under 1990s, an april march, canadian, dreampop, shoegaze . You can follow any responses to this entry through the RSS 2.0 feed You can leave a response, or trackback from your own site. Ah yes, I remember An April March. At the time we were Two Thirds Water (www.myspace.com/twothirdswater) and we used to play shows with them in Toronto and I think once in Guelph. Very nice people. So nice we stole one of their earlier drummers, Derek Millar! We were playing a show with them at Lee’s Palace one hot August evening and Derek was playing really well that night. Of course AAM had their big huge signature sounds that filled the box that is Lee’s. I always wondered what became of them after AAM and redhotred. No doubt Chris is in a studio somewhere and I bet they still write and record even if they’re not playing live or releasing new material. Chris, Danella…if you’re out there..Hi! We’re Dirt Farmer now (www.dirtfarmer.ca) and play every Sunday night at the Concord Cafe (beside L&M on Bloor). You’re welcome to play any Sunday. Ok, that sounds a bit plug’ish but seriously, would love to see you guys again. My good, that’s about 17 years ago. Unreal. Mike Klug – keep on rockin. You sounded great in AAM. Defintely a cool image. I found an old cassette tape with you playing… “Sick as a Dog”… Aerosmith! I know that this is eons later but thanks for the kind words!!! I have worn many hats in my musical day but AAM was my absolute fave! Great people and magical music! And especially great fans and friends were made over the years, which I miss all the time ! Thanks again for the kind words ! Cheers! I’d seen them live a couple times in Worcester, MA. Great live sound. Fan for life!